Tokai Forum - a subsidiary of TokaiRegistry.com :: View topic - Burny Super Grade - what would you do? Burny Super Grade - what would you do? Posted: Wed Sep 12, 2007 3:35 pm Post subject: Burny Super Grade - what would you do? I recently won a late 80s/early 90s Super Grade on Ebay. 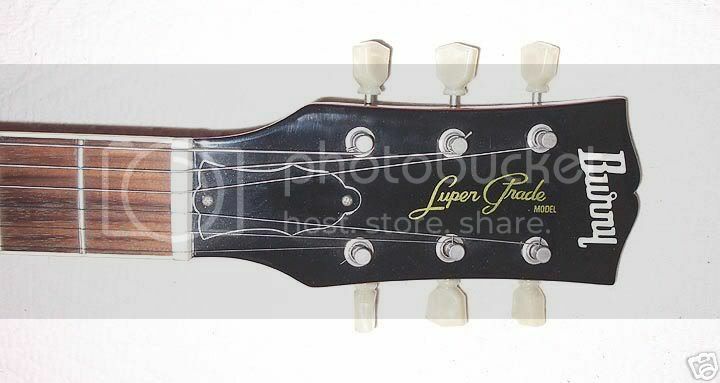 Has the winged TRC, a serial number in the cavity, short tenon and fret edge binding. Later VH1s. Three piece back, veneer top (but with some nice flame). When I got it, it was having some fretting out issues and around fret 15-16 a pretty bad buzzing. I had a friend of mine who normally does my set ups, set it up. He called today and said that everything is good except it appears that the fret where the buzzing is is too low and even if dressed I may lose the ability to keep it from fretting out. When I bought it I was allowed to have a 24 hour inspection period and the guy has actually extended that through this week when I had it set up due to the fretting out and buzzing issues. While my friend is very knowledgeable, I'm taking it to a more experienced luthier tomorrow for a further evaluation. I really like big necks and this one has a pretty substantial one. I got what I think was a pretty reasonable deal on it (right at $600 shipped). Is it worth it to either fully or partially refret or would you just return it and keep looking? It is in pretty good shape only one fairly minor ding and a couple of "dents" but nothing major. Clearly says "no fret wear" which is clearly not the case (although on most of the other frets there is very little wear). Also says sounds and plays great. There's no way that if it was played you couldn't have noticed the fret buzz at this one fret area. Not sure what "mic" the fret heights means. I did take it to the luthier and he seemed to think he could crown and level the frets without taking too much off so it was unbendable. He did say he may have to do some very modest scalloping in the one fret area. However if I had had to have had a total refret some planing of the neck would have been required anyway. At this point the cost is about $32. So I guess I'm keeping it. Not sure what feedback to leave for the person (who had very good feedback from others) as there is no way that if played in that neck position this could have been missed. I don't think it was even played before being sold as the strings were EXTREMELY rusty and in fact when I tuned them back to pitch (I assume they were detuned for shipping) the high E broke on the first bend. Any feedback from others would be appreciated. why do a total refret, when you have one low fret? I would keep it. If it plays & has the neck you like especially. 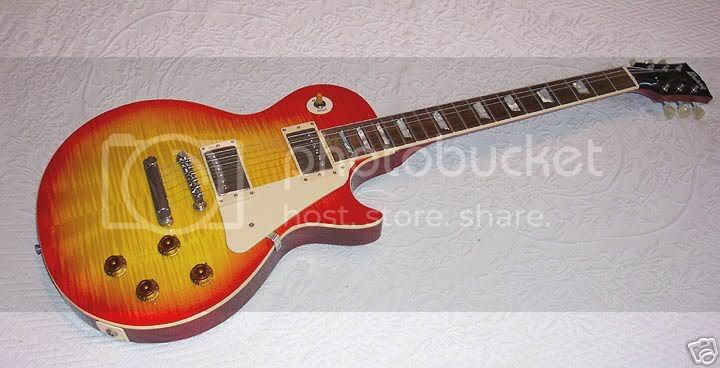 I have one of those up on auction as we speak & are nice guitars.Mine is 81910 & in the same cavity with same inking under the finish in bridge cavity. If yours also has the extremely well laid & pointed fret markers, great neck, excellent burst paint whicj I see yours also has, you would be hard pressed to do better for what you paid, I would just get the frets dressed & play it. Those are real VH-1's & the guitar looks totally original, mine is slightly later. Also that is a long tendon.....just doesn't have the tongue, but is a long tendon.......... side by side with a Historic the fret inlays on your guitar are just as good..I am picky about fret inlay..looking at your burst application again,,,I would for sure keep it,, very well done...There is alot of beater Super Grades going for what you paid easy..
nice Burny, very similar to my cherryburst one (which is soundwise a killer). If it is not as described, just return it. It seems to be a 90s Burny, and it should not be too difficult to get a rather similar one. Fret buzz doesn't come from (too) low frets, but from too high frets (e.g. if some frets have less fret wear than others). MIJ, I wasn't sure you could really replace one fret when the fret ends are bound (this one DOES have FEB). I got it back and most of the problems are gone. The low E still has some minor issues but I need to play around with it some. I've tweaked the truss rod just a tad from where he had it to add a little more bend and raised the action on the high E just a tad (I like to fight my guitars a little). Played it at a jam Sunday and it sounded awesome. The pickups are pretty good. So can anyone tell me what model this is? how are the pups in your guitar? 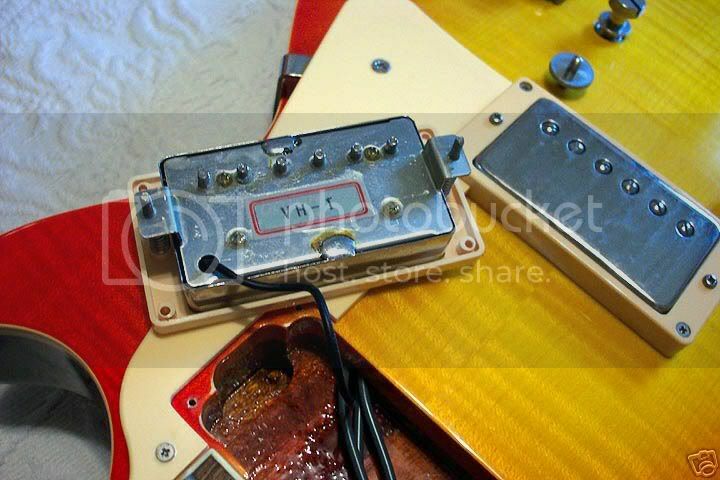 i have 2 90's LP customs (96 i think going by the number in the bridge cavity) both have vh1's. one has both pups with grey wire, and the other has the neck pup with black wire (as yours appears to be). the original 80's vh1's had black wire, and the 90's vh1's had grey wire. anyway, the pups in one guitar were fine, but in the other both pups had really bad microphonic feedback and had to be potted, even though they had already been potted during manufacturing. The pups sound great. No microphonics that I've noticed and I've played it pretty cranked. I haven't taken the pups off myself (those pictures were from the auction). They look definitively black in the picture where you can see the "VH-1" sticker but in the picture above that the wires look like they may be grey. I'll have to remove them myself at some point. Yep I knew the age, I'm looking to see if someone can ID the model. FYI, the frets do have FEB.
Actually the pups are slightly microphonic. 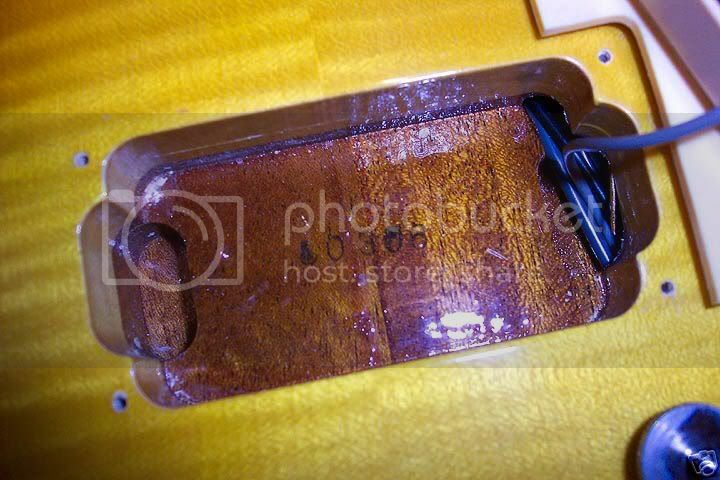 Where does one go to get pickups "potted" (waxed? )?